Beyond Convenient – That is how our clients describe our Over-The-Phone Interpreting service. What makes Over-The-Phone Interpreting distinctive is its accessibility 365 days a year, 7 days a week, and 24 hours a day. Whatever your industry, occasions arise when it is imperative to gain access to a qualified, professional interpreter immediately. Over-The-Phone Interpreting provides the advantage of immediate results. From Mandarin to Arabic to Spanish–access is almost instantaneous. Not only do we have immediate access to interpreters who speak over 200 languages, we can also pinpoint and select an interpreter that has industry specific training and language expertise for situations such as a legal deposition regarding a fire loss, an independent medical evaluation, or a meeting with foreign executives to finalize a joint venture business contract. Knowledge, understanding, and experience are key in such environments. When we say that it is as easy as picking up your phone and dialing–we mean it. Upon the initial set up of your account, you will be given a toll-free telephone number and an account number which is all you will need to request an interpreter, as well as gain access to billing information and job history information via our web-based client portal. We make it easy and just as importantly–efficient. Just as languages and dialects are unique–so are our interpreters. Along with exceptional credentials and professionalism, each interpreter exhibits the distinctiveness of their native tongue with each call. 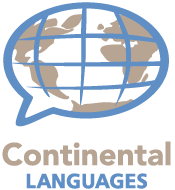 The high standards that we have built Continental Languages, LLC, upon are reflected in each and every call that an interpreter takes. All of our interpreters adhere to a Code of Conduct that is imposed company-wide by means of our Non-Disclosure Agreement. We understand that confidentiality is critical. Contact our staff today to learn just how economical Over-The-Phone Interpreting can be for your business. Our packages are customized to fit your industry, your volume, and your budget.